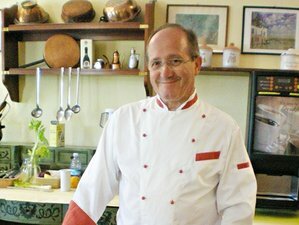 A great Tuscan cooking and wine vacation in the heart of Tuscany with Chef Paolo Monti. In this comprehensive hands-on cooking and wine tour, you will learn the best of Tuscan cooking and living. Learn more than 45 recipes with with effervescent Chef Paolo Monti and gain understanding of diverse cooking methods. Tour the walled city of Lucca. Visit the wholesale market for fish, meat, vegetables and fruits, cheese, and extra virgin olive oils. Visit great wineries in the Chianti area for wine tasting. Go on a day trip to Parma and Modena to see the production of Parmigiano Reggiano, Prosciutto di Parma and Aceto Balsamico Tradizionale. Chef Paolo Monti's Tuscan Sun Apartments are located in the middle of the Tuscan countryside among the fields and Sangiovese vignards, but only 5-minute drive to the center of Lucca - a quiet green paradise attached to Chef Paolo Monti's Cooking School and on the first floor above the restaurant La Cantina Di Carignano. You can choose among 4 newly remodeled Tuscan style apartments, wooden beams on the ceiling, comfortable beds, cooking facilities, but with modern comforts such as private bathroom, telephone, air conditioning, free WiFi and 32 inch flat screen TV. Check in at Tuscan Sun Apartments in Lucca. Meet the other participants in the lobby at 19:00 for aperitifs followed by welcome dinner with Chef Paolo Monti. 11:00 Hands on cooking lesson with Chef Paolo Monti followed by lunch. This class is very important, you will start with lesson on the origins of the Cucina Italiana, the main ingredients, fresh herbs, an extra virgin olive oil seminar, explaining how extra virgin olive oil is made and taste a dozen different olive oils to recognize the differences, according to where they are produced. You will then start cooking some of the most important sauces of Italian and Tuscan cuisine. Have a light breakfast! because you will make 14 recipes and will taste all of them. Afternoon excursion to Lucca and guided tour of the city. 08.00 Trip to see the fish and vegetable market for Italian vegetables, herbs and fruit, salami and cheeses; but mainly to learn how to recognize fresh fish and less then fresh fish! See different types of fish and what they are used for. Return to the hotel and start the cooking class with Italian seafood recipes. Dinner with local Lucchese specialties. 06:30 Trip the Parma province to visit Parmigiano Reggiano Dairy to see the production of this totally organic and wonderful cheese, followed by tasting the finished product of course. You then drive to Langhirano a "Prosciutto di Parma" maker, see how prosciutto is made in a Prosciuttificio La Perla. You visit the factory and see all the steps to produce this wonderful ham, followed by lunch with prosciutto, salami etc, and homemade fresh pasta with Lambrusco wine. After lunch you drive to Modeana to Acetaia Malpighi and visit the barrel rooms where the original "Aceto Balsamico Tradizionale" or traditional balsamic vinegar is made - an ancient tradition going back to the Roman Times - and of course taste it! Return to Lucca for dinner. 10:00 Hands-on Tuscan cooking class about typical Tuscan cuisine. You will make crostini ai fegatini, crostini alle melanzane, panzanella: the famous Tuscan bread salad. You will make the local vegetable ravioli and a delicious aromatic meat rag from Lucca with unusual spices, for main dish arista di maiale (loin of pork with typical Tuscan herbs). For dessert you will make cantuccini also known as "biscotti". Afternoon is free to relax, perhaps with a bicycle trip along the river or free to walk around Lucca. 08:30 Departure for Siena. You stop over in Greve in Chianti to visit this famous village in the Chianti region. Visit a Chianti castle and its cellars followed by wine tasting and lunch in Greve in Chianti. After lunch you visit another winery, Paolo's favorite one. 10:00 The final cooking class with Chef Paolo Monti. You will be learning how to make a proper risotto with shrimp and saffron, with porcini mushrooms, with red wine radicchio and speck, with squid ink. You will be preparing two types of traditional beef carpaccio and a buffalo mozzarella with a blended fresh tomato sauce and two desserts, semifreddo al croccantino. Final farewell dinner with Chef Paolo Monti. Chef Paolo Monti studied all aspects of restaurant and hotel work, as well as French, German, and English. His cooking classes are routinely held in all three languages. Striving to perfect his languages and skills, Paolo worked his way up the culinary and hotel industry ladder passing through several countries. During his career, he has launched and managed several restaurants and catering operations in several countries. His classes are conducted in a light, entertaining atmosphere. Lucca, a wonderful art town in Tuscany, is nowadays still surrounded by the Renaissance walls that had defensive purpouses in the past and now are like a jewel box that contains all the architectural beauties set on the city plan, like gems on a tiara. Lying on the Via Francigena and hosting a very important Christian relic such as the crucifix of the Volto Santo, have been great advantages for Lucca above all during the the Middle Age. You can't miss a visit to Piazza Anfiteatro, that mantains the shape of its origins (the square was built on a Roman amphiteatre) or either to the Guinigi Tower, amazing and peculiar with the holm oaks on its top. The park of the Serchio River creates a connection space between the town of Lucca and the river watercourse on a area of 250 hectares of width, where it is possible to go for a walk, to make excursions by foot, by bike or riding a horse, canoeing or kayaking, or even just have a break along the banks to enjoy the view of the natural beauties. There also are several recreational areas, such as football fields, archery fields, an area for playing bowls, model airplane and model car fields, as well as skateboarding ramps. Airport transfers and anything not specifically mentioned in the program. Follow the directions to Viareggio and take the road SS1 'Via Aurelia'. Enter the motorway A11 'Pisa Nord' towards Firenze. Take the motorway A11 'Firenze-Pisa Nord' towards Pisa. The nearest airport is Pisa International Airport (PSA). Chef Paolo Monti's goal is to give you a basic knowledge of contemporary Italian recipes and how they are prepared using traditional ingredients. Available all year round, with arrival on Sunday except Christmas and Easter weeks. Please select an arrival date below. This retreat can accommodate solo travellers.